As we come to the end of the year it seems timely to use this blog to highlight some of the progress we’ve made in ensuring the roles of nurses and midwives - in health protection and improvement - are supported and celebrated. It is important to note that in October two really key documents were published, emphasising the need to ensure that we prevent avoidable illness. This requires continuous vigilance in health protection and new action on health and wellbeing. Nurses and midwives in PHE know this and have a real opportunity to provide leadership and support to the professions. The NHS Five Year Forward View (NHS ‘5YFV’) sets out the ‘vision’ developed by partner organisations (including PHE) across the health system and explains the imperative to close the health and wellbeing gap and get serious about prevention. Because if the nation fails to get serious about prevention then our recent progress in healthy life expectancies will stall, health inequalities will widen and our ability to fund beneficial new treatments will be crowded-out by the need to spend billions of pounds on wholly avoidable illness. PHE’s From Evidence into Action: opportunities to protect and improve the nation’s health highlights our 7 priority areas where evidence shows we should focus our efforts and around which we can stimulate a new ‘movement for health’. NHS England and PHE have committed to do more to support people to manage their own health – staying healthy, making informed choices of treatment, managing conditions and avoiding complications, to engage communities in health, building strong partnerships and to create the NHS and health more widely as a social movement. Nurses and midwives are central to achieving these goals. In relation to protecting health we are continuing to take the system lead on various fronts. PHE nursing expertise has proved instrumental in the development of a national Antimicrobial Resistance (AMR) strategy. Nurse/midwifery leadership needs to continue to be promoted across the system at every level. We will work with those in education, commissioning, policy, management and leadership roles to increase awareness of AMR amongst all nurses and midwives. Our response to the Ebola international health emergency has, and continues to test our resilience and preparedness. We would like to take this opportunity to thank all PHE nursing staff for stepping up to the mark and providing expertise above and beyond their day job. PHE are leading the response for the system alongside the Department of Health, NHS England and professional bodies. This includes joint strategic nursing leadership and this has provided us with an opportunity to develop a stronger joint voice. PHE recently attended an Ebola nursing summit in Madrid alongside the RCN and this resulted in the sharing of valuable intelligence which will ensure a resilient and evidence based approach to ‘safe, ethical and high quality nursing care’. As part of our work to deliver the national nursing and midwifery strategy under the programme title of ‘Personalised Care and Population Health’, nurse leaders have worked with a range of nurses, midwives, academic colleagues and services to develop an approach which provides evidence and information, raises visibility, builds engagement and commitment and links to outcomes. This enables us to demonstrate the significant contribution our professions make to prevention and wellbeing and the potential which will be vital to closing the health and wellbeing gap. In 2014 we published, ‘Caring for Populations through the Lifecourse’ which sets out six activities for population health based on the domains of the Public Health Outcomes Framework. It supports practice by giving easy access to evidence-based research, guidance, standards, good practice interventions and outcome measures. We have also supported health promoting practice through advocating ‘Making Every Contact Count’. This year we have run three more very successful weeks of action with high levels of participation within and beyond our professions. 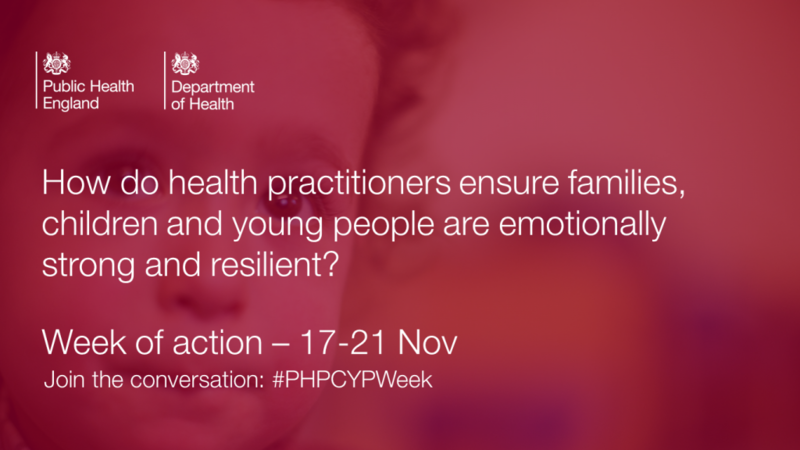 On social media we’ve built from 2300 Tweets with our hashtag when we launched a week on health protection in February to over 5850 Tweets for our last week this November on supporting families, children and younger people. Our week on health improvement and health promotion in June saw over 4400 people viewing our blog page! The International Council of Nurses chose as its theme this year, ‘Nurses a force for change – a vital resource for health’ and WHO Europe has titled its strategic directions for nursing and midwifery, ‘a vital resource for health’. In England we have made a significant contribution to realising this potential. We would like to thank all nurses and midwives for everything that you have done in 2014 to improve and protect the health of our nation. Our very best wishes for 2015 and we are looking forward to continuing to work with you to make a real difference to population health. Thank you for a great blog and I would like to reiterate the recognition and thanks to all nurses and midwives for the increased contribution that make to lives of many. I wondered if the blog could have identified more with mental health and well being too. I think this is pertinent in the context of the NHS Five Year Forward View too. Nurses and midwives play very important role for our nations peoples care. So we all are thankful to them hearty.